Todd Borg, award-winning author, will discuss his much anticipated Owen McKenna Mystery. 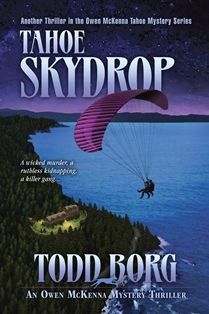 In Tahoe Skydrop, a brilliant young child who knows about computer encryption is kidnapped in an effort to unlock stolen software that could be worth as much as a billion dollars. Tahoe Detective Owen McKenna must grapple with both a murderous gang as well as with the child's impulsive and obstinate father who doesn't accept that his kid is transgender.